Zag’s last Listener (no. 4234, 9 to 5) was actually a non-mathematical puzzle, although the five 12-letter down entries were THREE SQUARED (=9), FOUR PLUS FOUR (=8), NINE MINUS TWO (=7), etc. This week’s puzzle was definitely a mathematical. In fact it was a very small mathematical with precious few clues. What’s more, the clues just referred to other clues. The trouble was that the answers had to be entered in a code which had to be deduced (each digit encoding to another digit). References to other clues referred to their coded entries. I thought that, since there were so few clues, the entry point into the puzzle shouldn’t be hard to find. 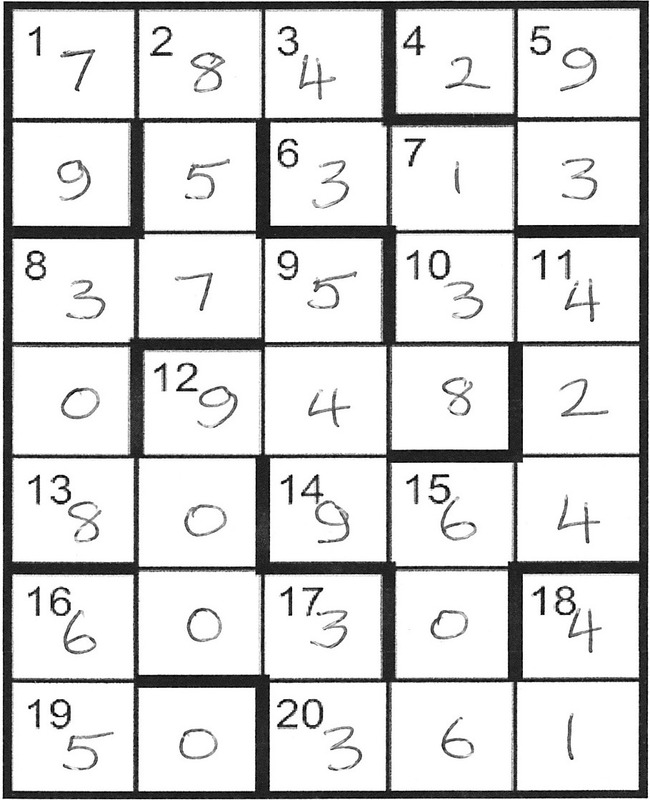 From 3dn, 20ac(entry) was a square with 3dn(answer) being its root. 1ac(a) was equal to 20ac(e) so was also a square. Since 20ac was three digits, 3dn(a) had to be less than 32, but squares (1ac(a)) don’t end in 2 or 3, therefore it had to be between 11 and 19 inclusive. Moreover, 20ac(e) also had to end in 1 since it was equal to 1ac(a), so we had 11²=121 or 19²=361. 121 had duplicate digits, so 1ac(a) was 361 as was 20ac(e), with 3dn(a) being 19. I was up and running. Well obviously this was going to more of a doddle than at first it appeared. And obviously, if you tackled this puzzle (even if you didn’t crack it), you’ll know how wrong that supposition was! I am in the fortunate position of knowing that our new blogger Jaguar has written a very detailed walk-through of the solution to Zag’s wonderful puzzle, so I will leave the intricacies to him. In all, it took me about eight hours, spread over two lengthy sessions and eight pages of scribble. Every hour or so, I managed to inch forward and enter a couple more digits. Even the home straight in the centre right of the grid took a lot of teasing out, but I got there in the end. All I could do was marvel at how little information could lead to a series of logical steps which enabled everything to get slotted into place. Just be thankful that we weren’t presented with Gridlock, Zag’s June 2013 mathematical puzzle in Magpie. The preamble for that started “The letters A to K form a complete set of randomly ordered clues. Solvers must construct the corresponding barred grid…” Lawks!! This entry was posted on 13 June 2014 at 3:55 pm	and is filed under Solving Blogs. You can follow any responses to this entry through the RSS 2.0 feed. You can leave a response, or trackback from your own site.